For what feels like an age, decorating with neutral colours has been the failsafe option. And while we love a clean, light colour scheme as much as the next person, we're increasingly tempted by the use of on-trend colours. But how to work out which colour works well with which? And what is a colour wheel anyway? 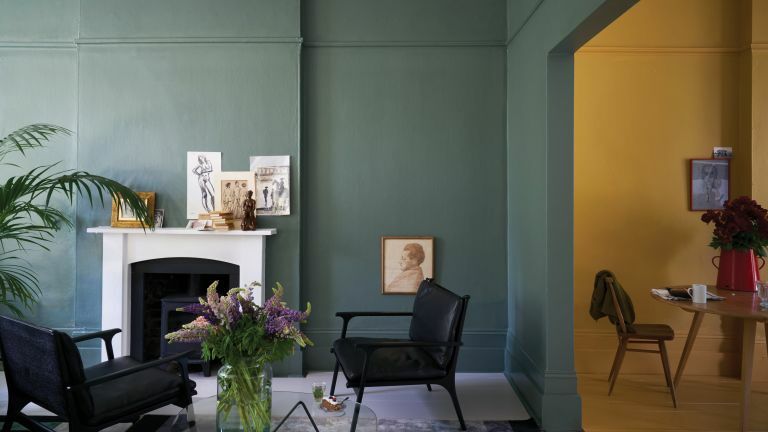 We asked Joa Studholme of Farrow & Ball for tips on how to use a colour wheel for interior design and scheming and she didn't disappoint. So if you are tired of decorating with these various hues of greige, and want to introduce some brighter colours into your interiors check out this expert guide. For more design advice and inspiration, check out our hub. Or, if you're focusing on incorporating colour into a specific room, you might want to take a look at our feature on choosing the right paint colour for every room. The wheel that we are most used to seeing today has 12 sections and includes tertiary colours, which are combinations of primary and secondary colours: yellow-green, red-orange and so on. This wheel can certainly help you to understand how colours relate to each other – those that work together and those that don’t. Colours that sit side by side are known as analogous, and are broadly harmonious when used together, resulting in natural-looking, tranquil spaces. You might think it would be easy to work with a scheme of harmonious colours, but careful consideration is required to avoid creating a room totally lacking in vitality when the contrasts are so subtle. Complementary colours are any two that sit directly opposite each other on the wheel, such as red and green. Using these creates schemes with maximum contrast, resulting in dynamic and exciting rooms with a more primal intensity. A colour scheme of complementary opposites also needs to be carefully considered to achieve a pleasing balance. When strong colours are included among them, it is often best to offset them with neutrals. Your starting point may well be deciding whether you prefer a harmonious or a complementary scheme, and in this case the rules of the wheel can certainly be an aid in your colour selection. However, use it with caution: the infinite combinations and the relationship between colours are oversimplified in the wheel, and there is so much more to creating a successful decorative scheme. Our colour blocking paint ideas provide plenty of inspiration, whether you're going for a harmonious or contrasting colour scheme. Natural lighting will have a significant effect on how a colour will look in a room, and your shade could end up looking vastly different to how it appeared in the shop. For this reason, it is best to view your paint outdoors and always take home a tester pot to view it in your planned room. It is not just the amount of light you need to think about, but also the direction of natural light. For example, northern light has a cooling effect on most colours, so if you are working with a north-facing living room, cream and neutral shades are better than pure white to avoid a cold, clinical look. Again, any mid-darker hues will help to warm an otherwise cool room. Use our advice below to choose the right shade of your preferred colour. Adored around the world, from the Victorian era to the present day, red is always warm and welcoming. It is also the most powerful of colours. Painting a room in red is not, however, for the faint-hearted. Strong reds are very well suited to dining rooms because they add drama and weight – they have a robust intensity and produce stimulating, powerful rooms that grab your attention. In contrast, a less vivid red will create a more restful atmosphere, as the effect of the colour strengthens over a larger area. More muted tones, such as Farrow & Ball’s Book Room Red, create warm rooms that are less challenging but still give a rich background, immediately evoking classical antiquity. While red is sensual, pink has a gentler feel and its effect is more soothing. Although it is often viewed exclusively as a colour for girls, the great 20th-century colourist John Fowler used pinks like Setting Plaster or Pink Ground extensively, creating spaces that were soft but still full of impact. Yellow has been enduringly popular since the 18th century, but it was only in the 20th century, when the influential interior designer Nancy Lancaster used the colour extensively, that it really entered the mainstream. It is still a mainstay of decoration in everywhere from farmhouse kitchens to contemporary living rooms, never failing to create a lively atmosphere in a room. Yellow enhances large spaces beautifully and also creates glorious rooms that are full of energy, whether with muted sophisticated tones, such as Hay, or the more vibrant, clean yellows. Rich yellows like these can be perceived as sunshine, particularly in hallways, so they are always welcoming and often have the added bonus of making areas appear larger. Top tip: Strong yellows are often best combined with a significant proportion of white to stop them being overwhelming. If you have a taste for the comfortable style of the English country house, tranquil and muted greens create rooms that are flexible and restful, as well as being the perfect backdrop to shabby-chic furniture and well-loved fabrics. They are best used with a traditional white, such as Off-White, to soften the contrast between walls and woodwork. For a more upbeat room, you need to opt for a more vital green, like Arsenic. These colours often feature in kitchens because their refreshing, outdoorsy feel gives a room breathing space and creates a happy atmosphere. The price of blue pigment once exceeded that of gold, but now the colour is more widely used in decoration than any other. It reflects the soothing tones of both the sea and the sky, creating rooms with a timeless appeal. Aqua blues, with their underlying green, produce pretty spaces that could never be seen as cold, making them perfect colours for bedrooms and bathrooms. The most relaxed and easy-to-use blues are those that lean towards grey. These shades work together seamlessly in any combination. The darker, more sophisticated blues, which create a really dramatic, glamorous feel, have increased in popularity as an alternative to charcoal grey. Over the past decade it seems that many designers have crossed over to the dark side for their paint colours. People are less concerned about space and more concerned with mood, with the result that deep, saturated colours abound. Although such shades are possibly not the first you would gravitate to, they can be an inspired solution in dark spaces, blurring boundaries so you can’t read the perimeters of the room. However, even in larger, open spaces, dark tones can flatter a room’s proportions; a very large-scale room may command a strong colour, such as Tanner’s Brown. Rooms painted in such seemingly simple colours evoke a complex response. They are undeniably moody, but have an unexpected hint of modernity about them, especially when only one colour is used on all the elements in the room. Deep, rich shades, such as Pelt, serve as the perfect background for home furnishings, and their warm undertone gives them a softness, making them soothing and romantic in bedrooms. From the muted grey tone of Down Pipe to the complex black-blue of Railings, darks are respectful of traditional proportions but can also create modern and dynamic spaces in the contemporary home. If you are inspired to embrace the dark side, check out more of these dark and atmospheric decorating ideas. This is an edited extract from Farrow & Ball: How to Decorate by Joa Studholme and Charlotte Cosby, published by Mitchell Beazley, £30 from Octopus Books. Looking for more decorating advice?